Managers of these traditional factories say the feeling is akin to flying blind. These are operations where plant floors, front offices, and suppliers operate in independent silos, where managers have only hazy visibility into downtime and quality problems, and where the root causes of inefficiencies are rarely understood or addressed. 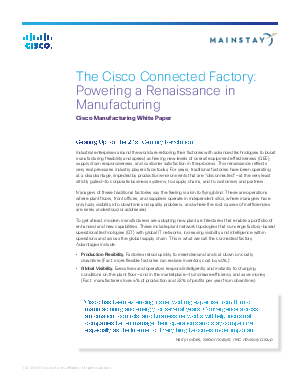 To get ahead, modern manufacturers are adopting new plant architectures that enable a portfolio of enhanced and new capabilities. These include plant network topologies that converge factory-based operational technologies (OT) with global IT networks, increasing visibility and intelligence within operations and across the global supply chain.